Fortrose & Rosemarkie Image Library - The Cathedral - c1930?? 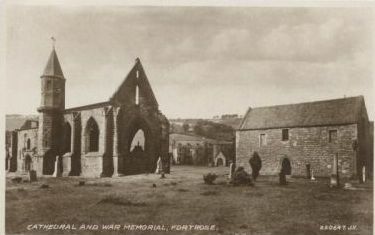 A postcard entitled 'Cathedral and War Memorial, Fortrose' published by Valentines and sold by Macdonald, Stationer, Fortrose. We need more of this and it needs to be advertised (if it already isn't) How about a link from the Community Council site. The Cromarty one is an amazing living history. The Local History Group are very interested in this kind of thing and I for one will be promoting it all the time from now on. Well done!